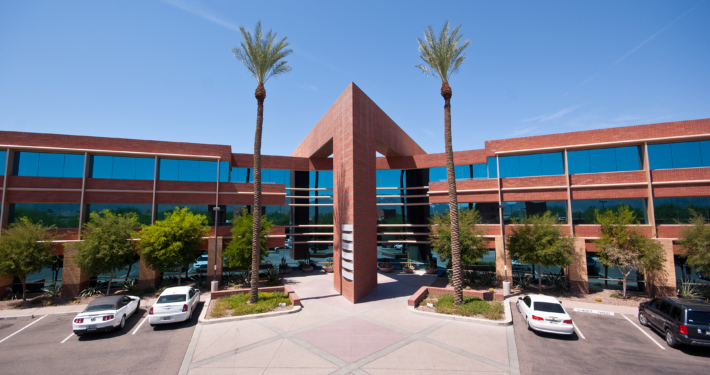 In a $52 million purchase online on Auction.com in 2015, ViaWest Group purchased this Class A, 3-story, 300,000 square-foot, two office building portfolio along the 101 Freeway in North Scottsdale in a joint venture with Contrarian Capital. Raintree I is a multi-tenant building, and Raintree II is a single-tenant investment leased to The Vanguard Group, the global money management firm, on a long-term lease. Each building has an adjacent four-story parking garage. Nine months after the initial purchase, Raintree II was sold to a 1031 exchange buyer. ViaWest retained management of the single-tenant office building and continued to execute the business plan of the multi-tenant building, taking occupancy from 70% upon purchase to a stabilized occupancy over 90% within two years.